From one of contemporary literature’s bestselling, critically acclaimed and beloved authors, a magnificent new novel set in Ireland, about a fiercely compelling young widow and mother of four, navigating grief and fear, struggling for hope. Set in Wexford, Ireland, Colm Tóibín’s superb seventh novel introduces the formidable, memorable and deeply moving Nora Webster. Widowed at forty, with four children and not enough money, Nora has lost the love of her life, Maurice, the man who rescued her from the stifling world to which she was born. And now she fears she may be drawn back into it. Wounded, strong-willed, clinging to secrecy in a tiny community where everyone knows your business, Nora is drowning in her own sorrow and blind to the suffering of her young sons, who have lost their father. Yet she has moments of stunning empathy and kindness, and when she begins to sing again, after decades, she finds solace, engagement, a haven—herself. Nora Webster is a masterpiece in character study by a writer at the zenith of his career, “beautiful and daring” (The New York Times Book Review) and able to “sneak up on readers and capture their imaginations” (USA TODAY). In Nora Webster, Tóibín has created a character as iconic, engaging and memorable as Madame Bovary or Hedda Gabler. Nora Webster by Colm Tóibín is literary masterpiece unlike anything I have read before. Riveting and stirring, this compelling story set in a small town in southeast Ireland in the latter part of 1960s and early seventies is about a young widow in her forties as she struggles to come to terms with life following the death of her husband who was a well-respected teacher in the community. Being widowed is difficult enough but to shoulder responsibility for the upbringing of her four children is a daunting task. Nora’s two sons are still in their early adolescent years. Her first daughter is in university while the younger one is preparing to leave for university. All her children are going through different phases in life. Nora and her children’s struggles are brilliantly portrayed. 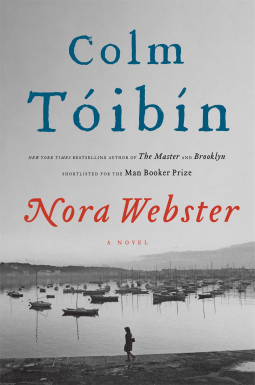 Author Colm Tóibín has created in Nora Webster a strong and intelligent woman who must rebuild her life, and face life’s challenges on her own terms. Set against the backdrop of the violent Catholic-Protestant clashes and other eventful happenings of the period, the author beautifully interposed it with the wonderful music of a delightful former nun who is a music teacher. It is in this contrasting setting that Nora finds the courage not only to move forward but to reclaim her life and her place under the sun. Nora is not just another character in a fictional story but one who through her story shows the reader how life is to be lived. What is simply striking about the story is how the author captures Nora’s transformation from a struggling, impatient young widow to a self-assured and independent woman as others watch in awe and curiosity. Colm Tóibín's Nora is also beautiful, intelligent, vulnerable and strong. She is a difficult person to like but at the same time difficult not to like her. Nora’s struggle and determination is an unforgettable reading experience. It is a story of loneliness, death, longing, determination and the power that is within each one of us to overcome any obstacle, however seemingly insurmountable it may be. It is a story of love, courage, compassion and hope. Colm Tóibín's masterful writing and ability to turn human psyche inside-out makes this book a must-read.